For great ideas in using felt balls check out our "Felt Ball Crafts" board on Pinterest and Follow our Pinterest page while you're there! Each felt ball averages a little over 3/4's of an inch (about 2 cm) and is made from 100%, beautiful felted wool roving. We import them from Australia, and they are made in Nepal by hand. Because they are made by hand, they can vary slightly in shape, size and color. However we find them to be VERY consistent. -Size: 2 cm, a little smaller than the diameter of a quarter. -Handmade from 100% wool roving. 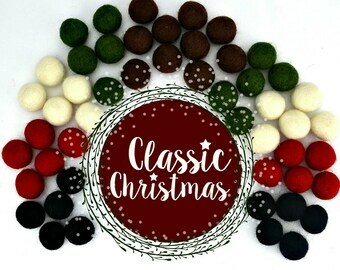 -Our felt balls are one of the best quality we have found. If we were to make our own, they would look like these! 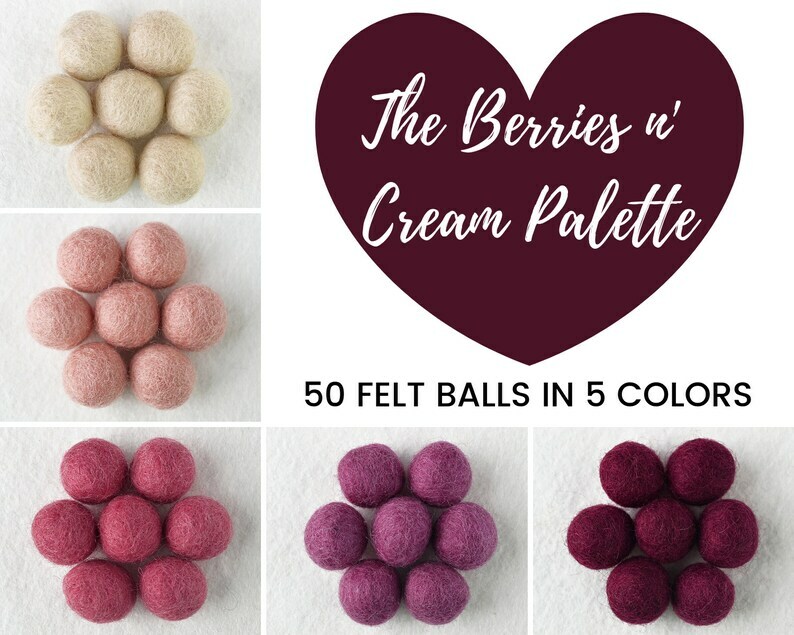 ♥.♥.♥ Please keep these felt balls out of the reach of children three years or younger. .♥.♥.♥. PLEASE WATCH FOR MORE SIZES TO COME .♥.♥.♥. Very pretty! I like the different color packs! Arrived safely and quickly 😊 thank you so much!! .♥.♥.♥. INTERNATIONAL BUYERS, PLEASE REQUEST A SHIPPING QUOTE. THE SHIPPING WILL BE OVERSTATED HERE WITH THE CALCULATORS THAT ETSY USES. WE CAN ALWAYS DO CUSTOM ORDERS FOR YOU .♥.♥.♥. Payment is due via PayPal at time of purchase....Domestic and Foreign. A Pay Pal account is NOT required if you want to use a credit card. Just click on the Pay Pal button at the end of your transaction, find the option "I do not have a PayPal account" then follow the instructions. It's easy and quick.Thank you. If you absolutely DO NOT use Pay Pal, We will accept a Postal M.O. Just convo me. We do offer exchanges, with the buyer to pay for additional postage. We do not accept returns (unless defective), however if there is a problem with your order, please contact us. We would love to be given the chance to resolve a problem versus having an unhappy customer. 1. Fast Shipping - as crafting mavens ourselves, we know how excited & full of anticipation handmade creatives can be when waiting for their supplies to arrive! We want it NOW so we can get started on our projects while the juices are flowing. That's why we place an extra emphasis on fast shipping! 2. Beautiful Packaging - what's more exciting than your supplies not only arriving with lightning speed, but opening them up to find them neatly and beautifully packaged! OneofTheFlock is not responsible for any orders that are lost, misplaced, stolen or damaged by the USPS. Your tracking number is proof your package was shipped. WE PROVIDE TRACKING NUMBERS ON EVERY PACKAGE SHIPPED. Article 2 of the U.C.C (Uniform Commercial Code) states when a product is sold and put into the hands of the shipper, the title and risk of loss is passed to the buyer. Our responsibility ends when the product is boxed and shipped or given to USPS, UPS, etc. Therefore complaints of missing packages is a shipper problem, not a seller problem and any complaints should be registered against the shipper, not the seller. Any claims made are the responsibility of the customer. We do not insure our shipments. You have the option to purchase insurance if you would like. Please make a note in the order comments section if you would like to do so. While we have a very high success rate of packages being delivered safely, there is always an element of risk when ordering anything through the mail. We do not require signatures upon delivery, so if you would like to purchase this option, please make a note in the order comments section. By placing your order with us you are assuming this risk and will not hold OneofTheFlock liable should your package not arrive. NOTE: USPS now includes, $50.00 worth of insurance on any package mailed via, Priority Mail. We ship to the address on your PAY PAL account, please make sure your address is correct, or convo us of a needed change. International Packages will just have a Customs # and no tracking. For International Customers- If you do not receive your order please contact me, however, once your items leave the United States I have no way of tracking down your package AND we cannot be held liable for it or its' contents. International customers are responsible for any import duty taxes if required. We gladly accept custom orders and will be happy to reserve a listing just for you. Feedback- Please contact me with any issues before leaving feedback, I would like the chance to make a situation right versus finding out by reading feedback you left for me. Communication is key. I have been asked if we trade or swap items. Unfortunately, I do not. I do, however appreciate your interest! One of The flock retains copyright to all designs purchased from our Etsy shop. By purchasing our patterns, you agree to the following pattern policy. 1. Sell the finished item/items that YOU hand made from One of The Flock's digital/e-patterns at: Craft Shows, on Etsy, eBay, and other on line venues. 2. Sell wholesale, finished products hand made by you within limited quantities. 2. Print and/or distribute or sell to any other individual or individuals. 3. Request a refund for paper or electronic patterns. ♥ If you are teaching a class using one of our designs, please feel free to do so, giving design credit to One of The Flock. We feel that this is an endorsement of our product, and also may generate new business for us. Thank you. How thick is your wool felt? The wool felt blend felts are typically 1 to 1.5mm thick. The 100% wool can be from 1.5 to 2.5 mm thick. The wool blend felt is softer than the 100% wool which is denser and thicker, therefore a little stiffer. The manufacturer of the wool felt recommends dry cleaning. How is your shipping calculated? We use Etsy's real time postage calculator. However, it is not always correct when multiple items are purchased. If you want to avoid being over charged, please ask for a custom listing. We do refund shipping overages. How quickly do you ship? PDF patterns are immediate. Everything else in our shop is typically shipped the same or next day, depending on what time of the day you order. Yes we do ship internationally. The Etsy postage calculators can really mess up the international shipping prices, so PLEASE ask before purchasing, and we can set up custom listings to get accurate charges. How do I pick my felt or roving colors? Each, "Choose Your Colors" felt or roving listing has several color charts next to the main photo. Go through the charts, select your colors and upon checkout, add them to the....Notes to Seller Box. If you forget to add it in the box, just message us from your Order Page, or through the Contact Seller feature on Our Home page. All of our Wool Felt is manufactured in the U.S.
All of our Wool Roving is imported from New Zealand. All of our Patterns are created and printed in the U.S.
What is the other conent in the Wool Blend Felt? Rayon is what is blended with our wool felt blends. Since rayon is made from wood pulp, it is a relatively inexpensive and renewable resource, so IT IS environmentally friendly. The Rayon wool blend, also retains the fire resistant properties of wool. What amounts do your Roving come in? 1/4 ounce which is approximately 14" to 16" long, and 1.5" in diameter. 1/2 ounce which is approximately 29" to 32" long and 1.5" in diameter. & 1 ounce which is approximately 58" to 63" long, and 1.5" in diameter. Our Sample Pack size is, .10 (1/10 oz.) which is approximately 12" to 14" long, and .75" in diameter.